A few years ago Marco Hennings held a Reiki-workshop about preventing violence at the “Jugendstrafanstalt ( juvenile prison ) Hahnöfersand” in Lower Saxony ( Germany ) with the help of a social worker of the facility. After discussions about the causes of aggressions and about underlying fears, he instructed the participants in the art of hand lay-up, first to themselves and then to each other. Once my Reiki-teacher told me: Someone, who learned to hurt a person with his hands, should in return learn to heal a person with his hands. This way you will find your way back to your inner peace. Through my personal training in Reiki I reached my inner peace. I changed and grew from being an aggressive teenager to be a relaxed and kind person. Today I like to share this experience with others. In times when news of juvenile violence is non-stop all over the media, I got the opportunity to show Reiki to juvenile inmates in the “Justizvollzugsanstalt Hahnöfersand”. The expectations I had in my work with Reiki and the idea of what effect it could have, were outperformed by far. Someone, who had seen a prison before, knows how it feels when approaching the entrance. Most people want to leave such a place right away. High fences with barbwire, watchtowers, closed gates, cameras. This is not a very welcoming place. I wanted to get in at all cost though. In my opinion it is just as important to show how to make a punch, as it is to show how to help people with the same hands. Even yourself. To show this, the art of Reiki is perfect, because you can learn it easily. You can use it right away and you even accomplish positive results fast. Did you notice, that angry people have a lot of stress? Did you try to be angry and aggressive when you are totally relaxed? Of course you didn’t, did you? That’s because it is impossible. In a relaxed state you are not able to become angry or aggressive. How does this actually work? Anger burns a lot of energy – Love gives us energy. If there is too little energy it causes stress. – If there is enough energy it causes relaxation. At this point I use the relaxing and transforming effect of the energy of Reiki. First my assistant and I developed a concept for the workshop. Then Mr. Tamm-Berg looked for suitable participants. We liked to work with teenagers in the age from 17 to 21. We needed about six weeks for the preparation and to set up everything for a smooth process. The workshop was supposed to last for two days. In these two days I liked to inaugurate the participants in the first degree of Reiki. The direction of the prison in Hahnöfersand was very cooperative and supported our work in every manner. We were allowed to use the gym undisturbed and we were supported by several guards. At the first day I introduced myself to the inmates and gave an overview of the workshop. At first they were skeptical, especially after words like “hand lay-up” were dropped. However as soon as we clarified existing questions, everyone agreed to participate in the workshop. The curiosity won over the primary sceptic. Before we got going, I asked the inmate to write down their most important moral concepts. The most important was to put first, then the second important and so on, creating a list scaling downwards. For example: Family, Success, Love, Money etc. Afterwards we collected their lists. At the end of the Workshop we asked them to repeat this exercise. We liked to determine if there would be any changes due to this workshop in the moral concept of these young people and if so, what these changes may look like. Normal workshops focus on subjects like “Reiki and healing”. The focus in this workshop laid on topics like Reiki and amongst others violence. This was an attractive combination for me, since I practice next to Reiki other martial arts like Kung Fu, boxing and the filipino Kali for 20 years. Therefore, I am asking questions like: What do you think, what is the reason why people fight? Have you been hit before? Did you fight with someone before? How did you feel during/after the fight? How did you feel when you lost/won? It was exciting to see the inmates agreeing that people fight out of fear for each other. They became more aware of fear being the greater motivation for violence. It became clear, that there are not just offenders and victims, but that both are actual victims. Victims of their fear, which is the motivation behind their actions. Interesting, isn’t it? After the interaction, I asked, how they felt and got answers like: It was very relaxing. – I felt comfortable. – The Problems moved away from me. – Somehow lighter. – I felt a little awkward, but in a good way. – Weird, I can’t explain how, but it was okay. Could it be, that I felt a prickling at my head? – Before I was angry at a guard, but not anymore. -For a short time you forget, that you are in a prison. Soon even I forgot, that I am in prison teaching Reiki to inmates. From this point on they were just “boys”. And again Reiki demonstrated me its wonderful power of love. I saw just humans and not inmates. Even the guards and my assistant were surprised, what happened in front of their eyes. There was a relaxing and harmonic atmosphere dominating the whole workshop. This doesn’t happen too often. Everybody works with everybody. Everybody is deferential with each other. At the second day of the workshop we came together for two hours and reflected the day before. We talked about Reiki, but also about subjects like respect. What does respect mean for you? Do you actually respect yourself? We got a clear “no” from all six participants. The second part of the day’s schedule included the repetition of the self-treatment and the repetition of the treatment with a partner while sitting. The power of Reiki was more realized by the participant than the day before and the process was more familiar to the boys. Later that day they learned the treatment with a partner while lying down. Everyone was highly concentrated during this part as well. I held the inauguration into Reiki in a small, separate tool shed. It was uncomfortable, but it didn’t bother us, because the boys felt good during the inauguration nevertheless. Again it was surprising, how respectful they behaved towards me and how thankful they received the inauguration. After the workshop we returned the second list of their moral concept. Some changed their evaluation. For example, some new values were mentioned like “helping people” and “gratitude”. Values like “money” slipped to the bottom of the list or disappeared totally. I was also very grateful to make this experience with the teenagers. Teenagers, who are violent, learned their behavior through all their life’s and they didn’t have caring role models. They are partly traumatized through own abuse and they abuse other people because of the distress they developed out of their fear. A vicious circle is created. Peer pressure and the momentum are taking their part as well. For a young person it is hard to break through this vicious circle. Reiki is a tool for me to reach the hearts of young people. Through Reiki they learn to cherish themselves, to build up self-confidence and to find their inner peace. Through this experience, they didn’t make before, they learned to cherish other people as well. They learned to do some good to other people by laying-up hands. Just someone, who loves himself, can show love to others. In my opinion Reiki will be a big part in the future of preventing violence. One day it could be normal, to use Reiki in prison, but also in other sectors dealing with the prevention of violence. The interest of the direction of Hahnöfersand is very promising. It could be the first step into the right direction. I would be glad, if my example would be adopted. I like to thank my assistant Dietmar Tamm-Berg and the Justizvollzugsanstalt Hahnöfersand. Through their help to begin with, it was possible to realize this workshop. 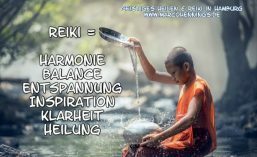 Dieser Beitrag wurde unter Artikel, reiki abgelegt und mit hand lay-up, healing from aggressions, inner peace, juvenile inmates, juvenile prison, love, Prevention of Violence, reiki, reiki in prison, reiki master, reiki workshop in prison verschlagwortet. Setze ein Lesezeichen auf den Permalink. I read your whole blog post Marco Hennings absolutely adorable project you did there.The whole world needs more of this.Great idea.